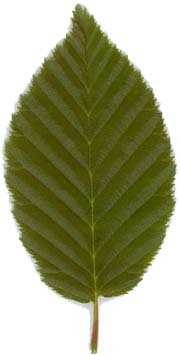 Hornbeam a sturdy deciduous tree superficially resembling Beech. Height max 30m. Age max 150 years. is a deciduous tree up to 30 m in height with a fluted trunk and smooth bark. It grows in woods and hedges, and is often coppiced or pollarded in oakwoods. It is native only on heavy clay soils in the South East of England. Male and female flowers are arranged in pendulous catkins and grow separately on the same tree. The male catkins are 2.5-5 cm long. The females are about 2 cm long. They open in April and May. Female flowers develop into long pendant clusters, with each fruit or 'nut' surrounded by a green 3-lobed 'leaf'. The middle lobe is much longer than the other two. Likeslow lying rich soils or clays and is shade tolerant. Can be coppiced or pollarded and is good for hedges. Natural distribution in South East England, Thames Valley and locally South Wales and Somerset. Also temperate Europe and Asia Minor. Extremely hard white close grained wood. Uses of wood - Good firewood and for producing charcoal. Was used for cogwheels and butchers chopping blocks. Blunts tools. Food and drink - Nuts attractive to birds. Seed is deeply dormant - treat as per Field maple. Approx 15,000 seeds per Kg. In nature seeds lie dormant on soil for 18 months. Frost hardy and not normally damaged by Grey Squirrels.